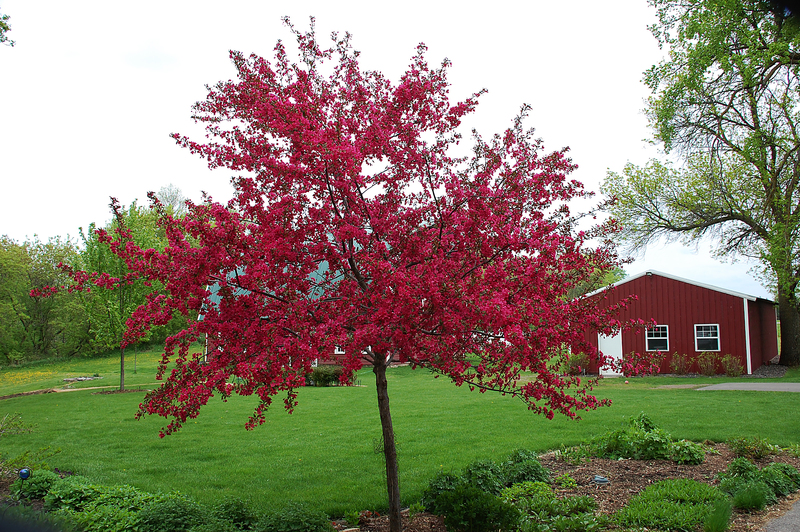 The Prairie Fire crabapple tree right outside my kitchen window is in full bloom . It is quite a sight and smells delightful. Apparently, we are not the only ones that are enjoying the tree. After two days of rain, snow and freezing temperatures, we were outside Sunday enjoying the sunshine when we noticed a distinct humming sound coming from the tree. A closer examination revealed that the tree was loaded with honeybees and a few random bumblebees. We stood and admired these amazing creatures for the longest time, just watching them go about their business of collecting pollen. I was most fascinated by seeing the yellow pollen carried by the bees. 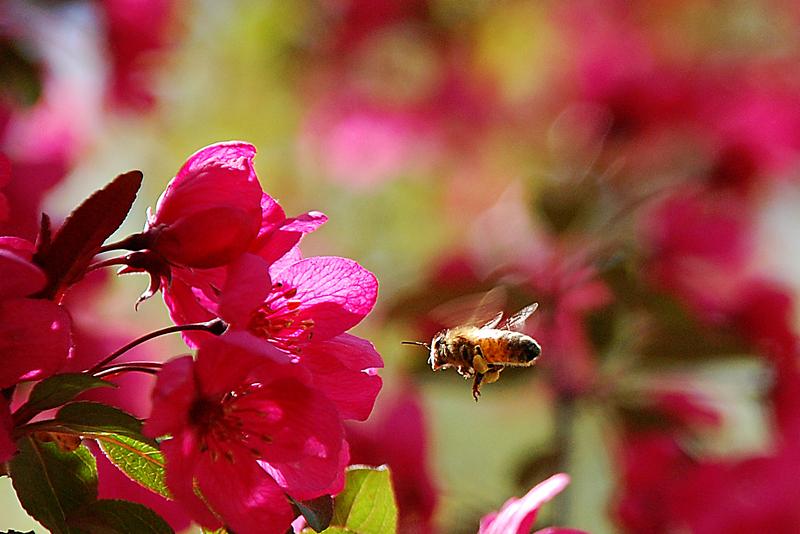 Worker bees have specialized hind legs for collecting and carrying pollen. The bee collects the pollen by scraping it off flowers and then transferring it to the pollen basket area of its hind legs. This worker bee has her pollen baskets filled up pretty well. Once a bee’s pollen baskets are full, she returns to the hive to deposit the pollen into a cell. The hive bees then pack the pollen and cap it with honey for winter. 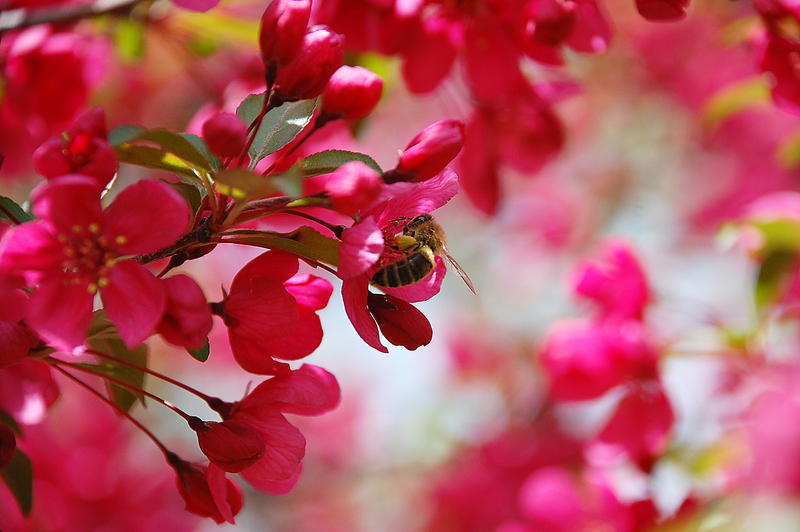 Of the numerous pictures I took of the bees buzzing around the crabapple tree, this one is my favorite. It captures the determination of the worker bee, with her beating wings and her loaded pollen baskets heading in to work another blossom. The idea of having honeybees was unnerving to me at first because I was concerned about having too many bees around. And since getting the bees, we have definitely noticed an increase in the number of bees around the gardens, trees and in the alfalfa field. The crabapple tree has never been loaded with honeybees like it was on Sunday. Honeybees are not aggressive, however, and instead of being nervous about having more bees around, I find myself seeking out these amazing creatures to observe them. If you have any interest at all in bees, take the time to learn about these important pollinators. Maybe even get your own hive! You will not be disappointed. Hello, visiting from Inadvertentfarmer and LOVE your home! Absolutely beautiful! My husband and I have grown up in Texas and pretty much stayed here our entire lives, haven’t seen something that beautiful in person-it looks like a painting, so calm and peaceful! Unlike here in parts of Texas, where the homes are stacked practically on top of one another….great blog! Nice pictures! Seriously… I want your lens!